Moose Teeth from Chichester, Inc. These moose teeth come from wild moose in Quebec, Canada. They have been cleaned, but not drilled. They are ideal for making pendants. They can be stained in tea to make them look old- fashioned. 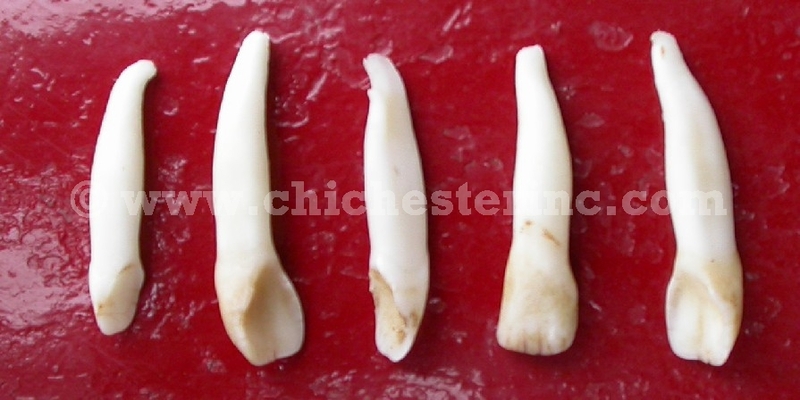 They average 1.75 - 2" (4.4cm - 5cm) in length and 1/4" (0.6 cm) in width. Moose are not an endangered animal. These teeth come from moose that have been hunted in Canada. The meat from the animals is generally saved. The animals were not killed just for their teeth. See our full selection of Animal Teeth.